Description: Early morning shadows are cast on this old Santa Fe C44-9W in Warbonnet paint as she heads a piggyback train. Description: Passengers from the Southwest Chief and the California Zephyr, both of which departed within the last minute, scatter as a westbound intermodal busts through. 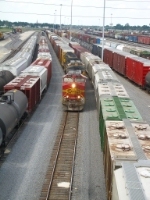 Description: Yarding a train at Galesburg Yard. Description: North end of the Yard. Description: Now why wasnt this up front? Description: A trio of Dash-Nines with a splendidly pristine Warbonnet in the lead with an eastbound grain train in tow await the passing of a westbound on the Wayzata siding. This picture was taken near the County Road 15 bridge that connects 15 to Highway 12. Description: BNSF 763 and two other locomotives running lite. Taken from a Metra commuter train at the Western Avenue Station in Chicago, IL.